So here it is, my little corner of the world! We are gonna see just how this works! I started this Blog to show off some of my Primitive things, and let you in on part of my life. We'll, see how it goes! If you don't know me, I will start this last summer. The 27th of June to be exact. We were hit by an F2 tornado. I saw it coming, it started over my neighbor (Sarah's) house. Of course, I am a chicken...I said ..Oh This is "Bad, Bad, Bad, and I am going to the basement!" John (my husband) thought (I guess as any man would) that he should stay and watch. "What were you thinking?" I am not sure how the thought process works..you know that one where they think they could outrun a 120 MPH wind....I have seen him run...trust me there is no way that is ever gonna happen! To make a long story short, when we came out from the basement, there was total disaster. 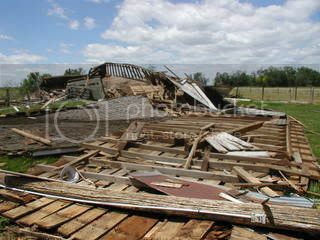 Our 95 year old barn, that I am sure had a soul, was totally destroyed, The only part that was not flat on the ground was resting on the Ford 8N tractor that was given to me by my Dad (Raymond H. Buehler). Our 10,000 bushel grain bin was crushed like a beer can (my friends will know what that looks like!). 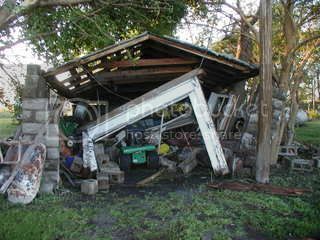 Our concrete block garage, which had seen better days anyway...was tossed like children's blocks. I later found the damage to the house itself, blown in windows, missing skylight, water damage to the inside of the house. Not to mention all the beautiful trees that had been growing for decades that had once stood stately guard over the place, were now twisted pieces.